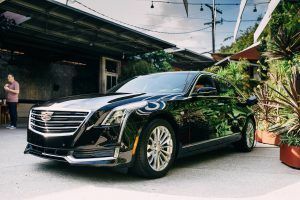 We’d like to present you with a rare opportunity—2 of Canada’s 250 Cadillac CT6 Plug-Ins are now available for sale at Budds’… If you’ve been wishing you could combine luxury with environmental friendliness, now’s your chance. Interested? Read on. The days when people admired gas-guzzling engines are over. Today it’s all about minimizing your carbon footprint. If you want the neighbors to think well of you, park a sensible electric or hybrid vehicle in your driveway. Trouble is, some of those cars don’t feel very luxurious to drive—or even to look at. They make too many compromises in terms of range, comfort and interior space. In short, being responsible with the environment has always meant giving up some motoring comforts. Introduced in 2016, the luxurious CT6 sedan tops the Cadillac range. Initially available with a choice of three engines, for 2017 Cadillac added a plug-in hybrid. A hybrid, of course, combines an electric motor with the gasoline powerplant. This improves efficiency as the motor “helps out” the engine. An electric car is charged straight from the electrical supply. With a plug-in hybrid, you do the same. Plug in to a 240 volt supply, and less than 5 hours later the 18kW lithium-ion battery in your CT6 is fully charged. Many regular hybrids can’t drive on electricity alone. But by contrast, the CT6 hybrid can travel up to 48 km on electrical power until the battery is discharged, at which point the gasoline engine takes over. That’s far enough for many owners to get to work and back without burning any gas. Unlike an electric car though, where the Plug-In really scores is its ability to make a long journey without the need to obsess over charging stations. In other words, no range anxiety! Under the hood, you’ll find a 2.0-litre turbocharged four-cylinder engine. This would be impressive on its own, but Caddy has married it to an Electronic Variable Transmission (EVT)—which is easiest to think of as two 75kW motors integrated into the transmission. Combined with the gasoline burner up front, this system channels 335 hp and 432 lb ft of torque to the rear wheels in a very linear fashion with no gear-shifting pauses. In terms of performance, Cadillac says the CT6 hybrid sprints to 96 km/h in 5.2 seconds. It can also travel at up to 125 km/h on electric power alone. That efficiency keeps a few extra bucks in your pocket, gives a maximum range of 643 km, but more importantly, means lower tailpipe emissions. Wide and long with straight lines and an imposing grille, the CT6 is a strikingly good-looking car designed to stand out from the pack. That’s especially so at night, when the vertical running lights really stand out. And while German autobahn cruisers all seem to cop one macho style, the CT6 is handsome yet restrained—dignified, not nasty. You might also notice the paddle shifters behind the steering wheel. These are for adjusting regenerative braking process that can be used to top up the battery. If you’d rather ride in the back—or you have tall friends—you won’t be disappointed there either. There’s enough legroom for a pair of NBA players, and a rear seat infotainment system to keep them amused on long journeys, as well. One word sums up the CT6 driving experience: smooth. Unlike those ‘prestige’ European marques, the CT6 doesn’t make you feel every imperfection in the road. Instead, you get a ride that’s soft yet not squishy or wallowing. It’s just, simply, really comfortable. The other aspect of this car you’ll really come to appreciate is how quiet it is. Even on the highway, the cabin is remarkably hushed. Take the CT6 hybrid on a long trip and you’ll arrive relaxed and comfortable. And you’ll also be entitled to feel a little smug at having done so in such a “green” fashion. Now all you need do is come down to Budds’ Chevrolet Cadillac Buick GMC and take a look for yourself. But hurry—we have only 2 of these 2017 CT6 Plug-Ins on the lot, and when they’re gone you won’t see them again. If this is your car… this is your chance.